In many ways, La Bahía de Navidad, on Mexico’s Costa Alegre (“Christmas Bay on the Happy Coast”), is an inexpensive, small-town version of up-scale Puerto Vallarta four hours to the north. With a Mexican population of just a few thousand friendly folks, the 500 or so full-year expats integrate easily into Barra de Navidad and Melaque, the two towns on the bay. Melaque is a typical ocean-side Mexican village where fishing, agriculture, and tourism provide a relaxed lifestyle for the locals. Barra de Navidad is chic and picturesque, with good restaurants and jumping nightspots, anchored by the elegant Grand Bay Hotel on the south-east side. Both of these towns receive thousands of winter visitors each year, primarily Canadian snowbirds celebrating their escape from the freezing weather back home by sunbathing and drinking frosty margaritas. Our 2016 Complete Guide To Healthcare And Health Insurance Options Overseas is your detailed, comprehensive, and current guide to your best choices right now for health insurance and healthcare as an expat or retiree abroad. Spanning the globe… from Ecuador to France… from Belize to Thailand… and from Panama to Spain… this new guide is the most complete resource available on this important topic. 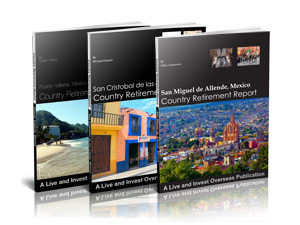 This is the retire overseas resource you can’t afford not to have.This all-new, updated and expanded report, in fact, is not one new report, but seven important resources you shouldn’t be without!.